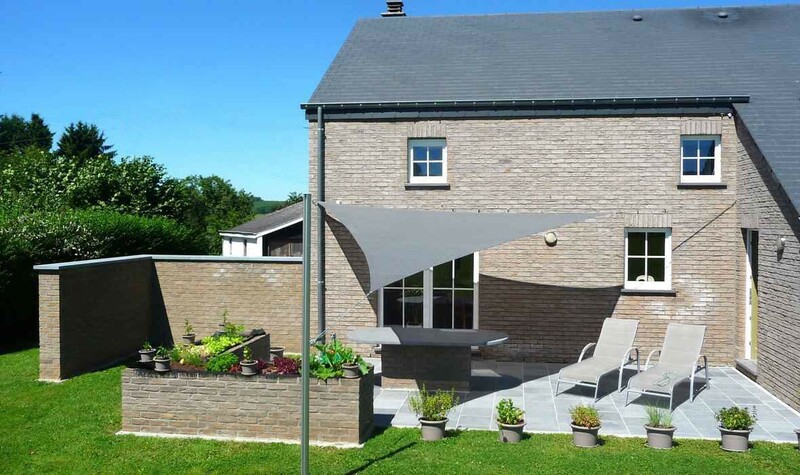 Espace Ombrage thought of all those who wish to benefit from flexible solar protection by installing a triangular shade sail on their patio, but who only have one available wall. We suggest a ready-to-use kit with 2 wall fixtures and an adjustable pole with which you can adjust the height of the canvas to the changing sun’s position. This fixture kit contains all the necessary supplies to quickly, easily, and safely tighten your triangular shade sail between a wall and a pole. 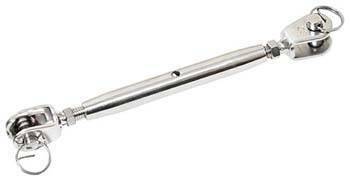 Contains 2 wall fixtures (short or long) and 1 adjustable pole. 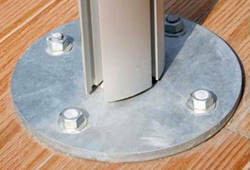 The pole contains a slide mounted on tracks to adjust the sail height and incline. You can adjust the sail height to the sun throughout the day. 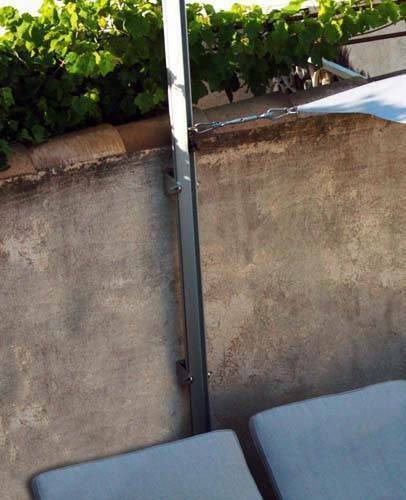 The given rope length can provide up to 2m50 space between the pole and the shade sail. Our long wall fixtures*: they are composed of a nautical rope and stainless steel pulleys and allow a large amplitude in the installation. The distance between the wall anchor point and the sail can vary from 35cm to 2m50. If your need to separate the sail from your wall or to tighten a large sail, opt for this version. 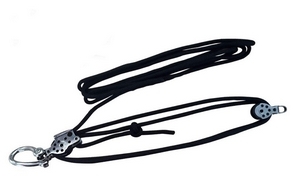 * The long reinforced mural fixtures contain double pulleys that facilitate the sail tension and render the installation more resistant, as well as 1 twist shackle. 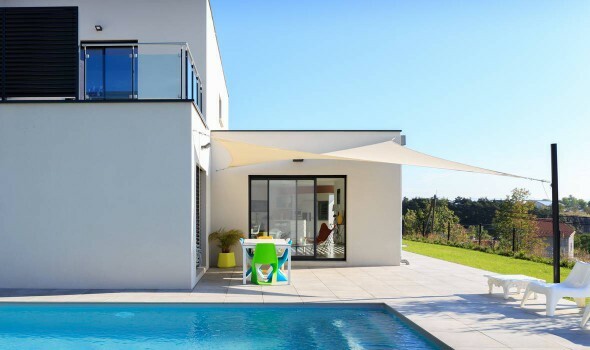 For the short wall fixtures: plan a tension margin of 32 to 40 cm in the continuation of the shade sail diagonals. For the long wall fixtures: plan a 30 cm minimum margin (and up to 250 cm). 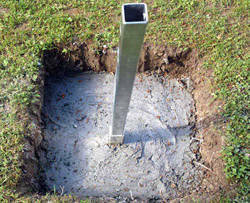 The piercing diameter for a concrete wall should be 14mm and a 70mm depth. 40 cm minimum in the continuation of the shade sail diagonals, by taking the measures on the ground (if the pole is inclined, the tension margin should be of 40cm minimum at the base of the pole). 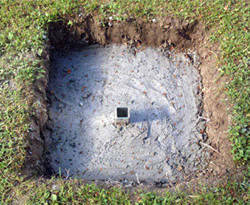 Create a 60 cm deep and 40 cm wide concrete slab in which the sheath will be sealed. The bigger the slab, the more stable the pole.